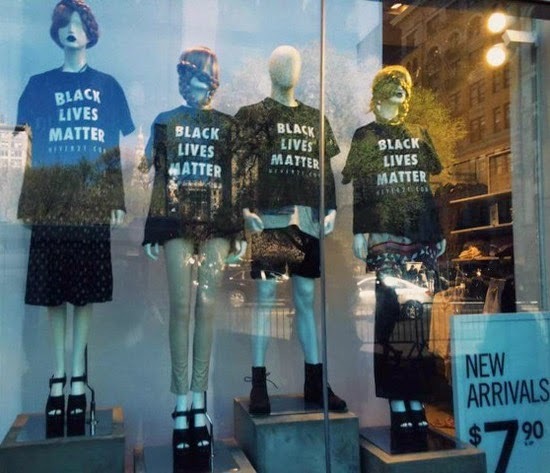 Activist Group Stocks Forever 21 Store in New York City With ‘Black Lives Matter’ Shirts As Part of the ‘Never 21′ Project. Activist Group Never 21 recently made a poignant statement on how state violence impacts children by changing the displays and hanging a banner in the window of a Forever 21 store in the Union Square section of New York City. Countless underaged lives have been lost at the hands of ‘vigilantes’ and disgruntled police officers. These youth were never given the chance to see age 21, or any age there after, so we respond by reminding the public of the battle that we are still actively fighting. We care about the lives of Black men. We care about the lives of Black women. We care about the lives of Black CHILDREN. We will not forget these lives – and will continue to do everything in our power to ensure that their voices continue to be heard. The display stayed up for about 20 minutes before it was eventually removed by store employees. It definitely attracted quite a bit of attention during a busy time in this heavily trafficked part of New York City. The group also stresses that the demonstration is not an attack on Forever 21. Watch video of the demonstration below.